Stir everything up and pour into 5-6 silicon cupcake liners (or 5-6 full-sized muffin tins). Place in the freezer for about 15 minutes. Enjoy! Note: These do melt quickly, so it’s best to keep them in the freezer when you’re not eating them. 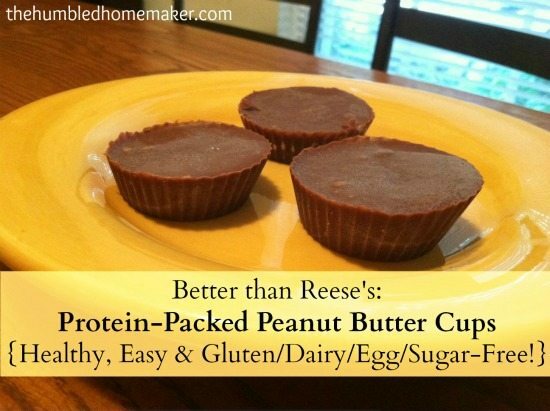 The post Protein-Packed Peanut Butter Cups appeared first on NuBody Fitness. The post Other Names for Sugar appeared first on NuBody Fitness. The post Newsletter appeared first on NuBody Bootcamp. 1. Mix all of the ingredients, except the lettuce, in a bowl. 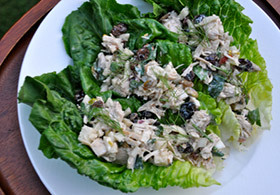 Serve by spooning the chicken salad in large Romaine lettuce leaves. Nutritional Analysis: One serving equals: 221 calories, 9 fat, 123mg sodium, 10g carbohydrates, 4g fiber, and 23g protein. The post Cranberry Chicken Salad appeared first on NuBody Fitness. This comforting autumn soup is filled with creamy pumpkin and savory turkey, while keeping it low-carb and high protein. Doesn’t get better than this! If you’re making this after your big holiday meal, feel free to use shredded, roasted turkey instead of raw, ground turkey. Simply chop the shredded, roasted turkey and add in the last 10 minutes of the cooking time. Enjoy! In a large soup pot, place the coconut oil over medium-high heat. Add the onion and cook for 3 minutes, until tender. Add the fennel, butternut squash and ginger. Cook for 5 minutes. In a large skillet place the ground turkey over medium-high heat. Cook until browned, stirring often. Drain off liquid. Add the turkey, tomatoes, pumpkin, broth, salt and pepper to the soup pot. Cover and cook over low heat for 40 minutes. Stir in the chopped parsley and cook, uncovered for another 10 minutes. Serve warm. Enjoy! Nutritional Analysis: One serving equals: 110 calories, 4g fat, 195mg sodium, 10g carbohydrate, 2g fiber, and 9g protein. 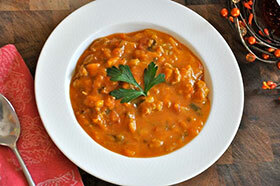 The post Turkey Pumpkin Stew appeared first on NuBody Fitness. Remove the chicken thighs, shred with a fork, and mix back in. Serve, using a slotted spoon, on the lettuce leaves. Garnish with sliced avocado, chopped cilantro and a sprinkle of fajita seasoning. Enjoy! 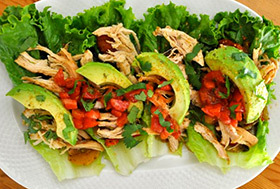 The post Slow Cooker Chicken Tacos appeared first on NuBody Bootcamp. GET MORE RECIPES LIKE THIS BY SIGNING UP FOR OUR NEWSLETTER ON THE HOME PAGE! 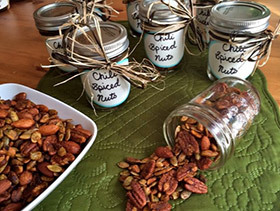 The post Chili Spiced Nuts appeared first on NuBody Bootcamp. The post Success Story appeared first on NuBody Bootcamp.